these weeks a bit busy, for the freedom world offers so many invalueable stuff. in these weeks, my family sites continued to expand, now including delicious accounts, which now support yahoo account's automaitcally login; tumblr blogs, which so powerful while so fit; seesmic, a twitter client can help me bypass the deadly blocking of twitter from China surveillance; and tweet.im, an autoposting service binding with gtalk account. i also seeing family site expanding within demestically, including 139.com, an affiliate of the monoply company, China mobile, and dii.cn, a twitter clone with neat interface. since yesterday, i felt i should preserve family 2 new namespace, riveryog for me and warozhu for baby son, warren zhu, Hope of China and God of universe, with facebook, the best and largest social network. China surveillance likely blocking facebook's sms service within its sovereign, for i tried several mobiles, none can receive facebook's verifying code in sms. i tried to reach out a Taiwanese among my google contacts, but his mobile also can't receive my facebook's verifying code. these weeks mostly sunny days. with God's beam, i like to fly at will. China surveillance blocking more and more famous sites, including google sites, goole apps, tumblr, hellotxt, posterous, and yahoo meme, but i was never daunted, each time i lose an open voice channel, i would try to compensate with new reach out to more brilliant western world sites. God's message never fade, or wind-gone, but populate springly. i enjoy seeing my future people voice here now, a missing treat for my loneliness i suffered so far in this eccentric corner of northeastern China. i enjoy the virtual team in God's shine, upon every directions of the globle. its also mostly lightened days, with so many games. baby son made every free moment gamed on my new notebook with my companion, imersing in games like "frontline" or "call of duty". play games is my long time dream, esp. when i saw quite less informed persons also enjoy themselves a lot in games, esp. first person shotting. i always love to see the advanced applications of artifical intelligence, or complicate interactive between human and robot or machine system, like games. but previously i always engaged in stuff more concrete, like download, resource management, site building, learning, etc. but baby's invitation these days drew me into hot games so deep and so imersing, that i really felt the world of colorful and possible. its a bright moment now, seeing sunshine over the trees parrel to office window. dog on facing desk biting heavily, as usual, and the dead roaming in the corridor. i enjoyed so many golden moments in my life. last night, i asked baby son to sleep alone me, he did after some time of play. in mid night, all of us, including his mother, emakingir, woke up, in God's set, to celebrate the love and glory. i just dreamed of a lonely pilot, who fight persistantly. God shown me what's manly and what's the ultimate hardness and grace a blessed can be. i again, after many times seen before in the end of holy dreams, the mightiest God, and the non-impossible. yes, gays and dogs biting now around. killing them just a matter of seconds. i see my second wife, Masheng, from Japan, changed this morning my bank deposit book into a deposit card, i saw the wells of my family never plentier and stronger. at noon i again saw the tall girl in QRRS, walking passed my office window. i sticked my head outside of the window, likely she noticed me. she is tall and fit, i hope God don't train more me harsh and coarse with loneliness and ever harder hopes in perished. Ok, now, Omen, God, save my Empire, bring me my beloved. benzrad, me, proud dad, holding baby son, warren zhu, hope of China, for a shot by emakingir. a corner view of south park, near emakingir's house. baby playing his scooter with his mom's companion. 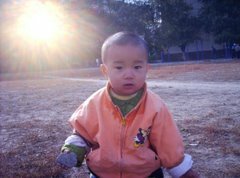 bright beaming: baby son, warren zhu, in a lol. more of my Autumn weekend hauntout.